Full sun to part sun. [24" tall x 30" wide]. USDA Hardiness Zones 5-9. Blooms mid to late season. Buddleia Lo and Behold 'Lilac Chip' PPAF. This plant continues the new series of miniature Butterfly Bush from Proven Winners. 'Lilac Chip' is a dwarf, seedless variety which reblooms until frost without deadheading. 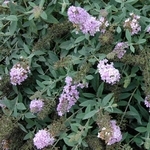 It has soft, lavender-pink flowers and is more compact than 'Blue Chip'. This remarkable plant forms a tidy short mound and does not need pruning or deadheading. It is also drought resistant and deer resistant. It can be used as a ground cover, low hedge or in containers. Continuous bloomer from mid summer through fall. Vegetatively reproduced shrub, not an inferior seedling.